Shantae embarks on her first full HD adventure! After three highly successful outings with Shantae, Shantae: Risky's Revenge, and Shantae and the Pirate's Curse, Shantae and her friends finally get a full HD console-based sequel! Boasting vivid, detailed high-definition graphics that retain the 2D hand-drawn sprites the series is known for, this newest entry in the Shantae series almost looks like a playable TV show! Presented as a stage-based 2.5D platformer with heavy exploration elements, Shantae uses her trademark Hair-Whip Attack to dispatch enemies, then takes advantage of her Belly Dance Magic to transform into 8 different forms that each have their own unique abilities and move sets. As new forms are mastered, old stages can be re-explored to unearth new items and secrets, ensuring there's plenty of content on offer for novices and platforming gurus alike. Topple the villainous Baron behind each criminal caper afflicting Sequin Land, and prepare for the ultimate showdown against Shantae's arch-nemesis: that bodacious buccaneer, Risky Boots! 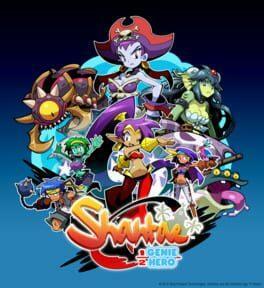 Shantae: Half-Genie Hero is available from 14.90 to 19.99 from 1 shops.